BTN editor Richard Cawthorne takes time out from his latest trip to Western Australia (WA) to renew acquaintance with one of the state’s top resorts, Mandurah. In one of those happy and quirky moments travel regularly hands out, I have discovered a new favourite Irish pub. Quirky because it’s in Australia; in Western Australia to be precise and, to be even more so, in the fast-growing resort town of Mandurah. Murphy’s (what else?) is halfway along Mandurah Terrace, which overlooks one of the community’s great assets, Mandjar Bay. The pub has been a fixture in the town since February 2007, a big, busy and cheerful affair that does exactly what it says on the tin. I have visited several times and always found it worthwhile. It’s not to everybody’s taste – there is entertainment every night, some of which can be boisterous – but it is fun, the food is good and plentiful (in the style known in Australia as “big serve”) and it claims to keep the best Guinness in town, with which I am not inclined to argue. There is a terrace and outdoor area for those who prefer things quieter. Murphy’s of course is far from Mandurah’s only attraction. The town sits beside an estuary from the Indian Ocean with beaches to match within easy reach. The estuary, twice the size of Sydney Harbour, is the backdrop that has brought new visitor experiences including award-winning waterfront dining, aquatic adventures, world-class golf courses and plenty of places to shop in the area complementing the natural assets, and led to Mandurah being recognised as WA's 2017 Top Tourism Town. 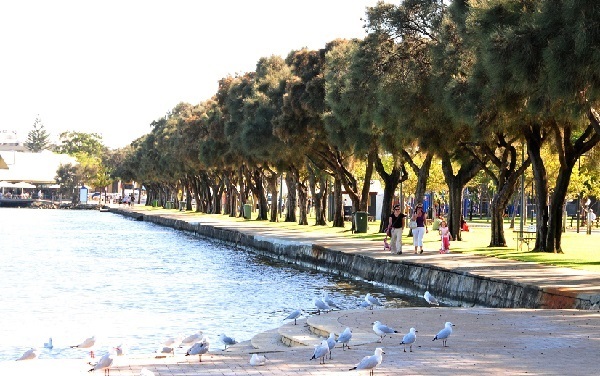 As noted, it’s a fast-growing place – WA’s largest and fastest-growing regional city, so it is said, so the Mandurah you see tomorrow may not be the same as today’s, but that’s the price of popularity. The area between the transPerth rail station and the start of the promenade alongside the water is already in the process of gentrification, some mostly attractively so but some not so good, and the small businesses in town are changing hands at a fast rate, with coffee bars, restaurants and estate agents in the ascendant. The rail station is another clue to the area’s popularity, bringing the WA capital, Perth, and associated business fraternity within an hour’s commute along a fast line that in a masterpiece of urban planning runs down the middle of the highway. Buses operate between the two cities and depart from the Perth city centre, while car drivers take the Kwinana Freeway south, easily accessible from many points in Perth, and exit at Mandjoogoordap Drive. However you travel, Mandurah’s attractions are equally easily accessible, with a wealth of information about what’s on and what to see. “The ultimate aquatic playground” is just one description as the region celebrates its waterborne setting and the miles of coastline, inland waterways and abundance of water-based activities it generates. Mandurah is also often described as a modern Venice due to a network of canals which, with the luxury homes alongside, can be explored on a cruise or by hire boat, while the region is also home to one of Australia's healthiest dolphin populations, which can be experienced up close on a dolphin cruise or spotted from one of the waterfront cafés. If you prefer to stay on the water, unwind and take in the views while slowly meandering down the Murray River or in the Peel-Harvey-Estuary, houseboats are available to hire. The resort also provides a convenient spot from which to take day trips to explore the wider Peel Region, with more winding waterways, wineries, rolling green hills and small towns surrounded by forest within an easy half-hour drive. The Creery Wetlands, on the edge of Mandurah, are part of the Ramsar Convention of Wetlands of International Importance. The 30 acres of nature reserve host more than 130 species of native and migratory birds, while in Lake Clifton and the Yalgorup National Park visitors can discover the largest reef in the Southern Hemisphere of thrombolites, living fossils that are among the earliest forms of life on earth. Putting it all in context, the first people known to have inhabited the region around Mandurah were the Bindjareb people of the Bibbulmun Nation, who named the locality Mandjoogoordap, which translates as “meeting place of the heart”. Visitors can learn about Aboriginal culture and history on a walking tour or boat cruise as well as checking out the several art galleries in the region that display Aboriginal art – a useful reminder we were not the first.